Mean Bean Co. has great cold brew and ground coffee, so if you're somewhat of a caffeine connoisseur, give their java a try. They've got special gifting boxes, too, that make for great gifts. We'll admit, we're not far away from being tagged as coffee addicts since even the slightest mention of coffee gets us all excited in a second. We tried Mean Bean Co's cold brew and would definitely recommend it to anyone who gets all jumpy at the mention of a cup of java (or because of it). We tried it hot and with condensed milk and we were all thumbs up on the first sip. You could even pour it over ice or just have it straight. They've also got ground coffee–100% Arabica, Peaberry Arabica and a house blend, so if you've got a french press at home, this is something you should try for sure. For the festive season, they're doing three gifting boxes that'll have different assortments of their cold brew and ground coffees. 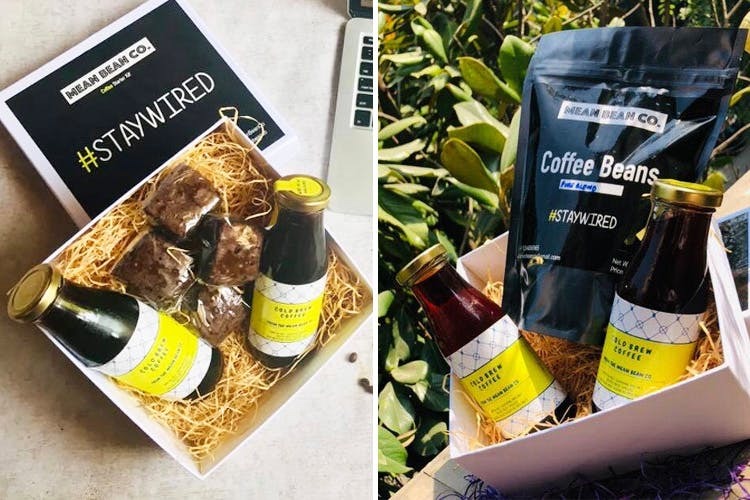 The first box–and we love this one–has 2 bottles of cold brew and 4 fudge brownies - obvious reasons. The other boxes have cold brews and a packet of house blend, and an assortment of all three ground coffees. We wish they had a website for easy online ordering. Their delivery times are super fast, so you won't have to wait for your coffee to reach you.